Devi Kund is the Royal Crematorium of the ruling family of Bikaner. 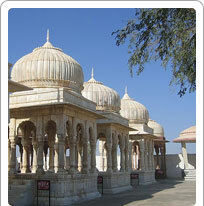 The cenotaphs or royal chattris of the House of Bikaji Rathore are in tradition Rajput architectural style and are all very neatly arranged. The earlier ones are made of red stone while the later ones are made of marble. The tomb of Maharaja Surat Singh is particularly interesting since it is built entirely of white marble and has Rajput paintings on the ceiling. Devi Kund is about 8 km from the town of Bikaner and takes about 20 minutes to travel to on a rickshaw.